Paste named Extremity one of the best comics of 2017, and for good reason. Space Mullet’s Daniel Warren Johnson had long been one of the comic industry’s best-kept secrets, an “artist’s artist” who hadn’t quite broken through to the wider readership. Extremity, his violent, bizarre Skybound debut with colorist Mike Spicer, finally rectified that travesty. 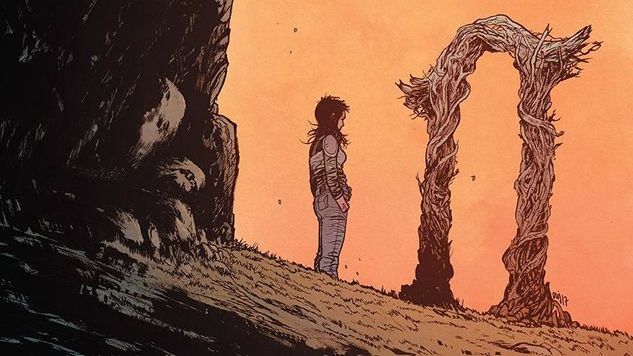 Like an outer-space Fury Road, Extremity is a bloody, fast-paced tale of tribal warfare in a sci-fi world that never conquered class stratification. And like Fury Road’s George Miller, Johnson thrusts his readers right into protagonist Thea’s revenge-driven conflict at breakneck speed, propelling Thea, her brother Rollo, a recovered death machine named Shiloh and the rest of the cast through 12 unforgiving issues. The finale, which hit shelves yesterday, leaves no character unaltered from their bloody journey, and Johnson has no interest in tidy answers or morals. To commemorate the conclusion of Extremity, Paste exchanged emails with Johnson. Be warned: the conversation covers deep discussion of faith, mortality, free will—and lots and lots of spoilers. Be sure to read #12 before you check out Johnson’s parting words below. Paste: Before we get into the deep stuff—how does it feel? You’ve been kind of an “artist’s artist” and fan-favorite for a while now, and now you’ve written and drawn 12 issues of an original story for a major publisher and it ended up on multiple Best of the Year lists, Paste’s included. Was finishing this final issue like crossing a finish line, or was it more of a weight off of your shoulders to have the story off of your work desk? Daniel Warren Johnson: Honestly? It’s pretty surreal. I spend most of my day indoors, working on my comics in my studio, and sometimes it’s hard to imagine that as I sit down to draw, someone else around the world is sitting down to read my comics. So, it’s even crazier to think that it’s happened for 12 months in a row! I finished the last page of issue #12 in October of last year, and when it was done, I got on a plane the next day to Ireland with my wife and took a week long vacation there. Since then, I haven’t really looked back, simply because I haven’t had time! I’ve been working on a new series, and I recently had a baby girl. I’m sad to see Extremity go, but I’m thankful for the story I was able to make and I’m very proud of it. Paste: Re-reading the series start to finish, I was struck with how much it reminds me of a Biblical parable, but with (even more) graphic violence. So much of the conflict with Thea, Rollo and the whole cast, really, is about faith—in each other, in institutions, in tradition, in violence. And in the backmatter to one of the issues, you talked about drawing inspiration for a ceremony in the book from an event at your church. How much of this comes from you intentionally reckoning with your relationship with faith and how much is just a byproduct of having these influences present in your life? Johnson: Something I’m trying to always be careful of is how explicit I am with my beliefs in my own work. It’s very important to me that I never hit my readers over the head with how I feel about something. I’d much rather deliver a story that I feel is of some sort of quality, and let the readers come to their own conclusion about it. That being said, I can never separate myself totally from my own work, and I want to be honest with myself within the story. That means that in order to give the characters life, I need to draw from my own experiences, which includes my faith. All the kinds of faiths you mentioned are incredibly complicated and not easy to answer, which is what I was going for in Extremity. I didn’t want anything to be easy. Paste: The Old Testament tribal conflict mashes up against some very contemporary themes, too: wealth and power imbalance, climate change, our relationship to technology, weapons of mass destruction. Was Extremity an opportunity to exorcise some of your anxieties and concerns about the current state of the world? Did you ever catch yourself approaching a theme or plot point that felt too real-world and not suited for Thea’s world? Johnson: The world of Extremity and the things that happen in it were created solely for the character of Thea. I almost had to create her in a vacuum, because the story was mostly about her and the actions she chooses. I had this idea of a girl who goes the opposite way of not only her family, but her enemies as well, and the best kind of world for that tale was the one you read in my pages. Any themes that arise from her arc are ones that are there accidentally. I wasn’t trying to say anything about the world, just about the characters in my head. That being said, I love that there are ways to take Extremity that are deeper than what I created it for. It’s wonderful to have so many eyes on the work and different thoughts about what it may mean. Paste: Getting into spoiler territory: Extremity #12 doesn’t end on a tidy note. Thea goes through hell in this series, and your final pages leave it somewhat ambiguous about how the tribal conflict will proceed from here. Major characters die and we’re left to wonder (and hope) if the younger generation is going to learn from all of the carnage. How much did your vision for the conclusion change over the course of making the book? Did you wrestle with how much you wanted to leave open to interpretation? Johnson: I struggled for over a year how to end Extremity. So much of what I had planned was becoming too finite, too certain. I wanted there to be a question mark at the end of the book, which highlighted where the characters may be at the current moment, but might choose differently after the last page is finished. If I had answered any more questions at the end of the book, it would have been saying too much. In this way, the readers thoughts are what is required to truly end the story. Paste: Were there deaths that were difficult for you to depict? Characters like Jerome are chasing mortality from the first page, but some of the others genuinely surprised and saddened me. How did you make sure certain deaths carried weight when so many of the fight scenes are meat grinders? Johnson: Great question! I think from the very beginning I was trying to show the stakes that the Roto were dealing with. Thea has real fears and must deal with them, but they only matter if there are actual things in the story to be fearful of. I tried to make sure that for each major death in Extremity, we see the reaction Thea has to their passing. Because we’re viewing the tale from Thea’s perspective, it’s easier to feel what she feels, and the deaths of each are felt by her tremendously. The final death in the book was the most difficult for me. I cried after I drew that page. Paste: I wanted to ask about Shiloh in particular, because while it’s heartbreaking to see Rollo killed, Shiloh is a more fundamentally upsetting character in many ways. He doesn’t want to become what he was built to be, but he chooses to compromise his beliefs to protect his friends. And in the end, he can’t stop what fate has in store for him. What were you trying to say with Shiloh’s arc? Do you think there’s an extent to which we can’t control who we are? Johnson: I think Shiloh was mostly me trying to wrestle with the concept of agency, with a sci-fi backdrop. Is it possible for something created for such evil could choose to be good? In the first arc, Shiloh defies expectations and (in my opinion) becomes a very strong character. The reason I think the part of the story you’re talking about is so sad is because his ability to choose is completely taken away, his agency removed. The scene where he takes his battery out of his head is one of my favorites in the series. Paste: You’ve mentioned Katsuhiro Otomo as an influence, but are there other major visual touchstones for Extremity? So much of the way your draw action seems to eschew Western standards for the energy and movement of manga, even though your line work isn’t what most people would consider “manga-influenced.” The structure of Jerome and Thea chasing down the people who wronged them also has a very Japanese-cinema vibe to it. Were there storytelling tools you consciously tried out for the first time in this series? What are you trying to push in your work right now? Johnson: It’s no secret that I have a huge panel count in Extremity, and a lot of that comes from Japanese storytelling. The first issue of Extremity was written on a plane to Tokyo, and a lot of the things I saw there visually influenced Extremity in a big way. I’m also a huge manga fan, but I love the looseness we’re seeing in a lot of American comics today (Simon Roy, Paul Pope, etc.). I wanted the best of both worlds, and that’s what started to shape the art style of my book. As for now, I love trying to push myself in specific ways when I draw. For instance, right now I’m focusing on drawing more interesting backgrounds, and doing my best to add as much character to them as I do my actual characters. Paste: You managed to coherently connect giant bugs, mech suits, Lovecraftian monsters, floating cities, suits of armor, flying mounts, speeder-bikes and dozens of other seemingly disparate sci-fi/fantasy concepts. Did anything land on the cutting-room floor? Or are you not sure if you’re finished with the world of Extremity? Johnson: A LOT of stuff is in my sketchbooks, either never used or changed in a big way. I’d love to show the world those concepts someday… However, the tale of Extremity is over. I’ve said all I will say with the book, and the characters will not return. Paste: What’s next on the horizon for you? Ryan Ottley just finished up Invincible and is headed to Marvel. You’ve done cover work for several different publishers recently. Are you diving back into the creator-owned writer/artist fray or are you carving out time to work on existing properties or with a writer? Paste: I’m back to creating a new series that I’m writing and drawing again! That’s all that I can say about it, except for the fact that there will be a lot of shredding in it. Stay tuned!